Infant walkers frequently cause severe injuries to children and should not be used as they offer no developmental benefits. Since the 1990’s these common items have injured at least 230,676 children in the United States. Because of the known risks, the American Academy of Pediatrics is moving for a complete ban on the manufacture and sale of infant walkers. The ban would be similar to one issued in Canada in 2004. Infant walkers can place infants in potentially hazardous situations. Because they have wheels, the devices can make it easy for a child to slide down stairs or careen down a driveway and into traffic. Children can also roll into a hot oven or slip into a swimming pool. Infants simply do not have the cognitive or motor skills required to keep themselves safe in such situations. From 2004 to 2008, eight infants died as a result of such accidents caused by the use of infant walkers. Stairs are the most dangerous hazard in the home and approximately 74% of injuries are the result of falls down stairs. Approximately 90% of children who are injured suffer head or neck injuries. Of the 5% admitted for hospital care, approximately 38% had skull fractures. 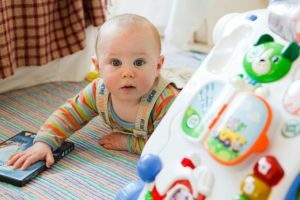 The US Consumer Product Safety Commission issued new safety standards in 2010 that were intended to reduce the number of children injured by infant walkers. The standard applied to x-frame, circular, adjustable height, bouncer, and open back walkers. The updated standards addressed the size, weight, and mobility of the walkers. They also required manufacturers to use standardized calculations in the design and safety testing processes. However, many of the updates did little more than require manufacturers to add additional warnings and instructions. The updated safety standards are credited with helping to reduce the number of infant injuries by 22.7% during the four years following implementation. However, over the past eight years approximately 2,000 infant children each year continue to suffer serious injuries while using the devices. It is a rate that strongly indicates that these mobile devices continue to pose far more risk that can be effectively mitigated. Nationwide removal of the devices from the market would go a long way towards protecting large numbers of children from potentially life-threatening injuries and it is likely that the proposed ban will receive strong consideration.